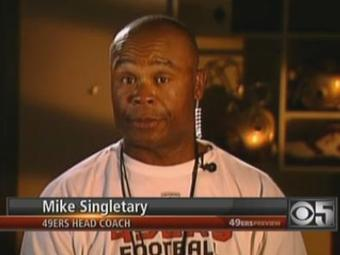 Mike Singletary's team got smoked by Seattle opening week and some rat 49er fink told Yahoo Sports! the team's losing faith in offensive coordinator Jimmy Raye. Enter CBS 5's Dennis O'Donnell, who asks Singletary about the issue with which he apparently had enough. Exit CBS 5's Dennis O'Donnell, with manhood shattered.